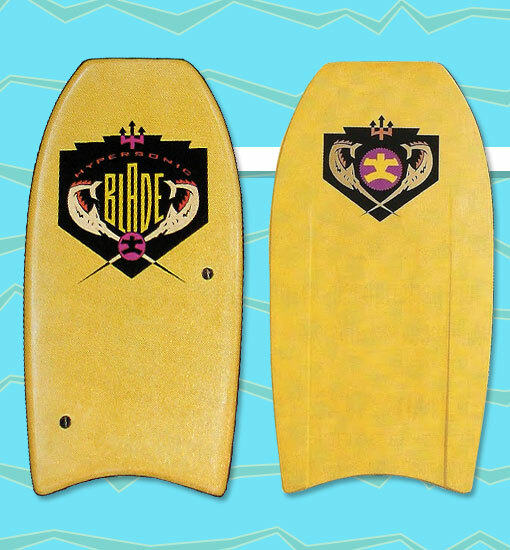 The Hypersonic Blade seemed like a bodyboard from the future. It was advertised as "a rock-solid board allowing speed that blows every other board out of the water". The ad was right on the money: the board was hard as a rock! The company proudly boasted that the "high rigidity is guaranteed to prevent creasing". The board was made with Kevlar -- the same material used in bullet proof vests -- so the board was likely to stop a bullet as well. Despite the Hypersonic Blade's fairly low retail price ($75), the board ultimately faded into hypersonic obscurity.